I like traveling and I'm lucky that I get to travel a lot. However, my solo trips are usually ten days max. This is the first time that I have traveled for such a long period by myself. I think I might have made a few mistakes this trip, which has impacted on the success of it. Have I seen a lot of different places? Yes, definitely. But, part of me feels that when planning the trip way back in March, I went for quantity rather than quality. A person goes on holiday to rest, relax and recharge. I forgot that in my initial planning of the trip. I looked at a map and thought, it would be cool to stop off at these places. Then I planned one day for traveling and 2 days to explore. That was my biggest mistake. While you can explore a city in 2 days, you need more time than that to factor in relaxation time. Rushing from tourist sight to tourist sight leaves you exhausted, and then you have to pack up and move onto the next destination. And, when I planned the holiday I didn't look at how one can get from one city to the next and the cost that involved. Maybe it would have been better to visit fewer places and spend a week at a time in each destination. Sometimes, it's not a matter of just jumping on a train or a bus. Take getting from Valencia to Malaga for example. A train trip would involve going via Madrid, with a few hours stopover, and another train to Malaga. This would have taken about 8 hours and cost over 100 euros. A bus trip was also over 100 euros and would take close on 12 hours. I opted for catching a lift with someone who advertised the place in their car on Blablacar. This only cost me 30 euros so I thought I had secured a bargain. The car was small, had no air conditioning, the driver didn't speak English and had 3 paying passengers squashed onto a back seat that could only fit 2 people comfortably. Because I had a carry on suitcase as well as my huge suitcase with the broken wheel, I had to hold my carry on suitcase on my lap the whole trip, with my face pressed against the window. 6 hours. I did not have a fun time. Never again. That's all I'm saying. Loud Spanish rap music with driver and co-driver rapping the whole trip. Fun times. Not. Malaga more than made up for the disastrous trip to get there though. Dragging my big suitcase with the broken wheel to catch transportation was another nightmare. Next time I need a suitcase that does not develop Popeye-type muscles in my right arm. I need to travel lighter, although washing clothes on a 6 week holiday isn't the easiest. By the time I got to Sevilla I was starting to get tired of my own company, and dare I say, tired of exploring. I just wanted to chillax, but the trip I had planned way back in March allowed no time to chillax. It was go, go, Go! It took 3 buses to get from Tavira to Portimao. By the time I arrived at Portimao I was so pissed off with traveling, I was ready to call it a day. It was at that point I decided that it was okay if I didn't see everything and it was acceptable to spend the day sitting outside eating gelato. Portimao to Lisbon took 2 trains, the second one delayed over 2 hours because of technical difficulties. Lugging the big suitcase with the broken wheel, my smaller suitcase and backpack was no joke in the extreme heat. The first train I had to stand for over an hour because a mother and her two teenage daughters thought it was acceptable to each sit on one seat and have their bags on the seat next to them, thus depriving three people of seats they had paid for. I spent my time on that train thinking of suitable curses to put on the three of them. This trip has given me way too much time for personal reflection. It's quite depressing actually, when you look back on your life and the many mistakes you've made. When you travel with someone you don't have time for thinking about your life. But when you are alone, there is too much time for introspection. I think a solo trip longer than 10 days might not be good for my mental health. I feel compelled to record my trip with photographs. I realise that few people will bother to look at my holiday pics, but it is important for me to do. You see, I have noticed that my memory is going one word at a time. It might take me a while to remember a particular word. The other day it was 'bouncer.' 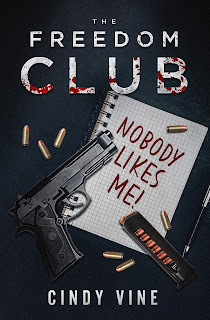 I had to say, "The person who is like an armed guard vetting people who go into a club." And the person I was talking to said, "Oh you mean a bouncer." So my hope is that when my memory is completely gone, some kind person will direct me to my Facebook where I have all my holiday photo albums, and I can look through the photos of the places I've been, things I've seen, people I've met and I can remember. I was here. I did live my life to the fullest. I existed. Cindy Vine is an author, teacher, mother, currently living and working in Norway. Cindy writes the kinds of books she enjoys reading. Books with real life issues that are thought-provoking and take you places you never thought you might go. 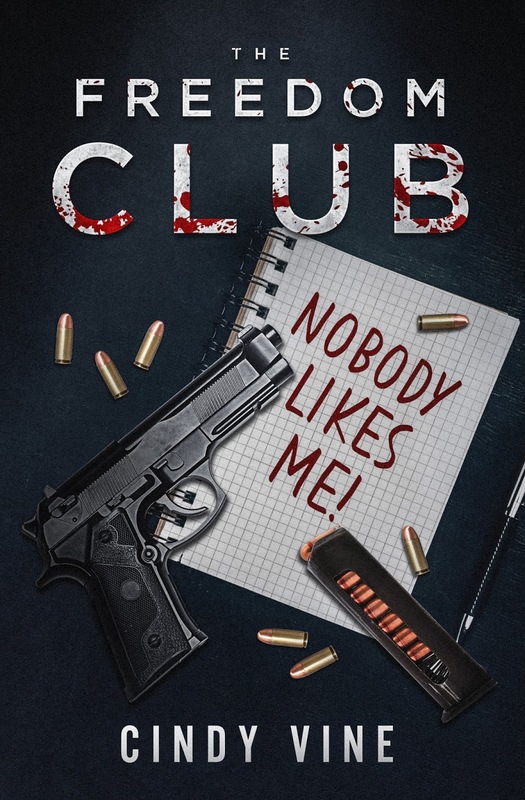 The Freedom Club is Cindy Vine's latest book. It deals with the sensitive subject of high school bullying, teen suicides and school shootings. You can buy it here. All Cindy's books are available on Amazon.com in both paperback and kindle formats. You can find some of Cindy's other titles here.